By Lani Shamash, of thepeoplespower.co.uk, writing on the UK energy market. Mistrust, alienation and inertia. 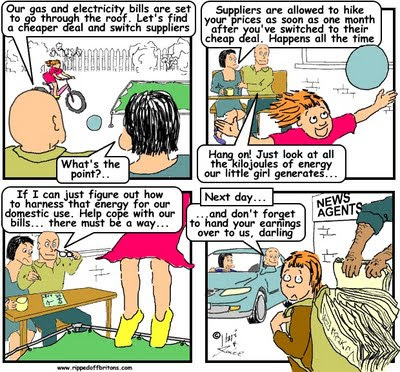 They’re consumer characteristics which have become synonymous with the UK energy industry as customers, the media and the government rail on a daily basis about the evils of the industry. We all talk about it, we all write about it, in fact I’d go as far as to say it’s a national pastime, a conversation topic so customary it’s become more of a Great British staple than the weather. After all, it’s not just isolated to the energy market, but now synonymous with the pharmaceutical, housing, mobile phone and, of course, financial industries, to name a few. Clearly, in its current state, the relationship between energy suppliers and household consumers is skewed. And it’s a costly skew too; we collectively over-spend £4 billion a year because we’re on the wrong energy tariff. So when, last week, Nick Clegg announced that he had made a deal with the major energy companies, expectations were high. So what was agreed? Once a year the ‘Big Six’ will tell consumers whether we’re on their best tariff. Anything else I hear you ask? Er, no... That’s it actually. It’s not much, but it’s a step towards something which we all desperately need; simpler, fairer energy bills. We need it to end the frustration brought on by the thousands of different tariffs which are changed with more regularity than an incandescent light bulb. Or to combat the sense of defeat in the person who throws that quarterly bill straight in the bin before even attempting to decipher its contents. And we need it to prevent the horrifying headlines on the fuel poverty epidemic which, according to a report commissioned by the Department of Energy and Climate Change, contributes to the 27,000 excess winter deaths that occur each year. But most of us do nothing. The vast majority of us don’t even switch energy suppliers despite government advice telling us to. It might have something to do with the prospect of a big penalty, a phobia of forms, or a cynical little voice in your head which tells you that they’re all the same, that it’s a lose-lose situation so why bother. But you’re not alone. You could join dozens, hundreds, thousands, and even millions of other little people to become a real force. Group bargaining’s an old idea, but it’s still a good one, and with the advent of mass internet access the possibilities are endless. And that’s what thePeoplesPower.co.uk are all about- empowering UK households to get a fairer deal on their energy. The concept is simple: consumers group together in large numbers and thePeoplesPower.co.uk negotiates a better deal based on their stronger combined purchasing power. And there you have it, the balance shifts: customers and suppliers have a relationship which is fairer and more sustainable. Some of you may question this model, I can hear the cynics nay-saying, the critics doubting; What if the energy companies refuse to play ball? What about green energy? What are you getting out of it anyway? Well, as much as we all love to demonise energy companies, they’re not the devil incarnate, but organisations which are focused on profit margins like all companies. And getting a massive chunk of custom in one go is great value for them. Besides, this model has been tried and tested already. In the Netherlands it’s helped households save around 20 per cent on their bills. Inspired by our European counterparts, thePeoplesPower.co.uk decided it was time for the UK to go Dutch and set up as a not-for-profit Community Interest Company. But we wanted to offer solutions to the entrenched problems of the energy market, rather than allowing ourselves to become another part of the problem. The first step was to be totally upfront about what's in it for us. We settled on a £2 referral fee (charged to the energy company) per household switch which allows us to cover our minimal costs (we don’t advertise and our four person team all work as volunteers). £2 allows us to pass on more savings to households and offer something more attractive to energy companies than the standard switching site (who charge energy companies somewhere between £40 and £70 per switch). We also provide members with the option to negotiate for green energy, in this way working to dispel the myth that green energy is an expensive luxury. We also put a cap on the amount of people we switch in one go. But, surely, I hear you ask, the more people you sign up, the better deal you can negotiate? Well, no, actually, or at least we don’t think so. By keeping the numbers small and capping it at 20,000 per switch, we ensure that all energy companies can participate, big and small. This way we don't compound the problem of an uncompetitive market place. On a practical level, having a cap also avoids switching chaos- even a huge energy company would struggle to smoothly switch 50,000+ people in one go. In this way, we think we’ve found a collective switching model which can work for both consumer and provider, thus restoring the balance, and in turn, our confidence in an essential industry.